Increasingly Anaerobic Digestion Processes are being Applied To Municipal Solid Waste (MSW) for the production of biogas as a renewable energy source, and also for Waste Diversion. Waste Diversion in this context means the diversion of waste (especially organic waste) away from landfill. 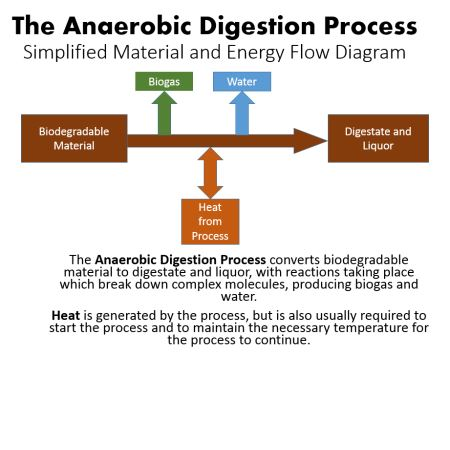 The Anaerobic digestion process flow diagram of materials and energy flow. Anaerobic digestion (AD) of MSW is often part of an MBT Plant (Mechanical Biological Treatment Plant) and the AD process is applied to the organic fraction of the waste which is separated from the mixed residual waste which the householders place in their “black bag” and is known as residual waste. To start with the municipal solid waste feedstock is macerated (chopped up in specialized knifing equipment) with the addition of a large proportion of process water to provide either a dilute thin (‘wet’), or thick (‘dry’), slurry that can be fed into a digester tank. This stage also normally includes a useful decontamination stage to remove heavy and light contaminants through wet gravimetric (gravity based) separation. The digestion process takes place in sealed tanks (digesters) that are normally mixed thoroughly using externally mounted pumps which pull the liquor out into the pump, which while returning it ejects it at speed again into the tank, or stirring blades, to maximise contact between microbes and waste. Mixing can also be achieved using the methane gas by pumping it out from the reservoir above the digester reactor into the tank, and allowing it to bubble up to the surface to create a mixing effect. The AD process can be operated at mesophilic (typically 30 – 40°C) or thermophilic (typically 50 – 60°C) temperatures (see Table). 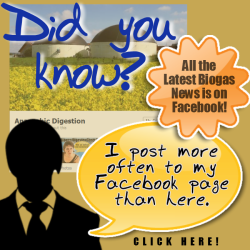 Dry Anaerobic Digestion processes work well in the thermophilic range of temperatures. Wet processes can be either mesophilic or thermophilic with the first being the most commonly adopted for MSW AD. The EU Animal By-Products Regulations (ABPR) (current at time of writing but in case of changes readers must check for themselves) require the pasteurization of MSW which is classed as a mixed source AD waste, to a standard method which ensures a temperature of 70°C for one hour. UK legislation has an alternative option which (at the time of writing) requires treatment for 57°C for 5 hours. AD processes can be single step processes where all the waste is placed into a single digestion stage (biogas reactor tank) or multiple step processes. Multiple step processes usually include a separate hydrolysis stage, which can be either aerobic or anaerobic. Hydrolysis (heating to a high temperature and raising the pressure) is used to optimise the breakdown of complex organic material into soluble compounds. This is most often followed by a high-rate AD process for biogas production. The AD process can take place in a number of vessels, or just one, but normally two are employed, one as a hydrolysis vessel and the second as the digester. An example would be to use thermal hydrolysis of the organic content of MSW followed by anaerobic digestion to produce a biogas that is burnt in an engine electricity generator set. The reason for using a hydrolyser, is the addition of this process stage results in more of the degradable material in the feed being converted into biogas, rather than just passing through and emerging in the digestate. The key process stages which would be seen in the waste processing plant (MBT Plant or MRF) include an MSW reception area, shredding, and a form of wet separator, where the biodegradable material is separated from the inert and reject (sometimes called “contrary”) material. 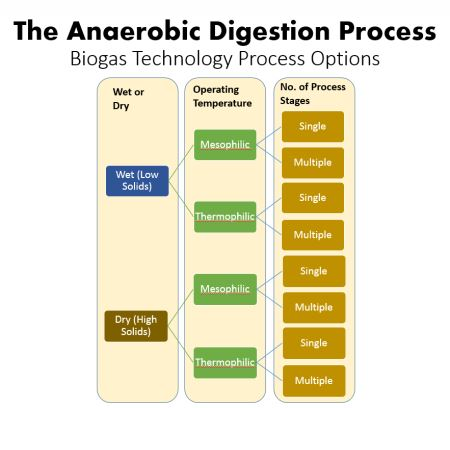 A thermal hydrolysis stage is a feature of many MSW biogas process systems, followed by a one stage anaerobic digestion process. The AD plant utilizes the biogas produced is often used to power an engine, which powers a generator, with waste heat recovery that delivers the steam and heat to the hydrolyser and digesters. It is accepted by many AD professionals that the rate-controlling step in the anaerobic digestion of MSW is the hydrolysis of complex materials such as cellulose, in paper and leaves etc. in the waste. The process converts the waste into small soluble molecules such as glucose, which can then be easily digested by the biogas producing microbes. In the commercially available process this conversion is accelerated by heating the material under pressure to around 150°C. This results in substantially more of the biodegradable material being made available for conversion into gas and ensures the feed material is also sterilized, as required by the EU Animal By-Products Regulations. After this initial anaerobic composting period (when there is biogas production) the raw compost is placed in windrows (often out in the open) to mature for an additional 5-6 weeks, in the same way as for aerobic composting treatment. The matured compost is then passed through a trommell screen to remove any plastics. In a final processing step to produce a digestate product for sale, the compost can be blended with additives (e.g. sand, brick dust). Plus, Nitrogen, Phosphorus and Potassium) can be added to meet different specifications from wholesale and retail sellers, and bagged if required.